Shiho Miyano (宮野 志保 Miyano Shiho?) is a former Black Organization researcher, codenamed "Sherry" (シェリー Sherī? ), who was working on APTX 4869. After the Black Organization killed her sister, she took APTX 4869 to commit suicide but shrank instead. She fled the Black Organization and now currently goes under the alias of Ai Haibara. Shiho Miyano and her older sister, Akemi Miyano, were born into the secret crime syndicate known unofficially as the Black Organization. Shiho's English mother, Elena Miyano, and Japanese father, Atsushi Miyano, were both important researchers for the Black Organization. They both died in what other members of the Black Organization described as an accident while Shiho was very young. While Akemi lived a normal life, Shiho was sent to America as a small child to go to school and was groomed to finish her parents' research on APTX 4869. Most of her time in America was lonely; she ate lunch alone, and was otherwise isolated from her peers for being different. Despite the difficult social situation, Shiho was an academic prodigy, and by the age of thirteen she was working as a highly ranked scientist for the Black Organization. Her codename in the Black Organization is "Sherry", after the alcoholic drink. Her only real friend was Akemi, who only involved herself in the organization to get Shiho out. At some point she might have visiting the Mermaid Island, where there supposedly lived a woman rumored to be immortal. Shiho was about 18 years old when she developed the most current incarnation of the experimental test compound APTX 4869. Although it was not her intended purpose, she discovered that it could be used as a poison to kill without leaving any traces of itself in a body. While researching its effects, Shiho noticed that one of her lab mice had become younger after being given the drug instead of dying. Meanwhile, the Black Organization started using APTX 4869 to commit untraceable murders. After the death of her sister at the hands of Gin, she rebelled against the Black Organization, refusing to complete any work for them until she received a satisfactory explanation for why her sister was killed. Instead she was confined to a small room to await her execution. She took an APTX 4869 pill she had pocketed earlier to commit suicide, but shrank instead to elementary school child age. That allowed her to slip her handcuffs and escape via a rubbish chute. Her only hope was her suspicions about the potential survival of Shinichi Kudo, the only unconfirmed death of the human trial subjects. She fled towards Shinichi's house, but collapsed in the rain outside the house of Shinichi's neighbor, Professor Agasa. Agasa found and adopted her, and she now lives with him under the alias Ai Haibara. Initially, Shiho was very cynical, which was reflected in her valuing her own security above idealistic principles of justice. She also did not wish to become close to others. While attending school in America, she ate lunch alone. It was only by repeatedly approaching her that the Detective Boys and Ran finally became her friends. Shiho was also untrusting of others in general, and preferred to put on an expressionless, cold mask while bottling up her pain and sadness. Shiho's views about death have been complex and at times contradictory. She was prepared to likely kill Ki'ichiro Numabuchi with APTX 4869 as part of her tests, but on the other hand, she detested the Black Organization's use of APTX as a killing tool and Conan labeling her as a murderer. 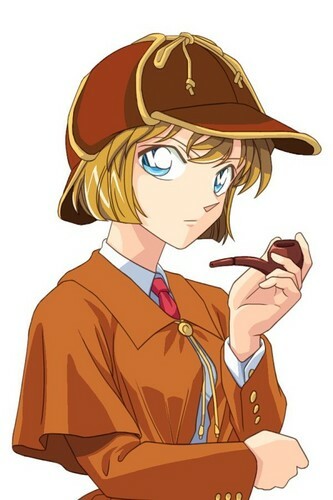 Her fascination with her work seems to be stronger than fear for the organization, while she was still a member, since she risked changing Shinichi Kudo's data to avoid him getting killed before she could study him.